Molly Pwerle’s country is Atnwengerrp and her language is Anmatyerre and Alyawarr. She was born in approximately 1919 (no records exist) and has had little exposure to western culture. In fact, Molly picked up a paintbrush for the first time in 2004. Molly’s extended family are all artists including her sister the late Minnie Pwerle, Barbara Weir, Aileen and Betty Mpetyane, who all encouraged Molly and her younger sisters Gayla and Emily Pwerle to paint with their famed sister Minnie. In late 2004 Barbara Weir, Minnie Pwerle’s daughter organised the first workshop of the sisters which was held at Ultja station. This inaugural workshop heralded the start of an amazing painting experience. Just as Minnie showed the glorious freedom of expression, Molly, Emily and Galya followed suit. Another workshop was arranged and so it continues. Minnie took a close and supportive role in the development of her younger sisters. The sisters had an instant response to applying paint onto canvas, developing expressions of their dreamings that have been passed from generation to generation. Keeping the culture alive through the passing on of these symbols and patterns ensures the survival of these peoples in the harsh desert conditions. Molly paints “Awelye Atnwengerrp”, meaning women’s ceremony in her country. 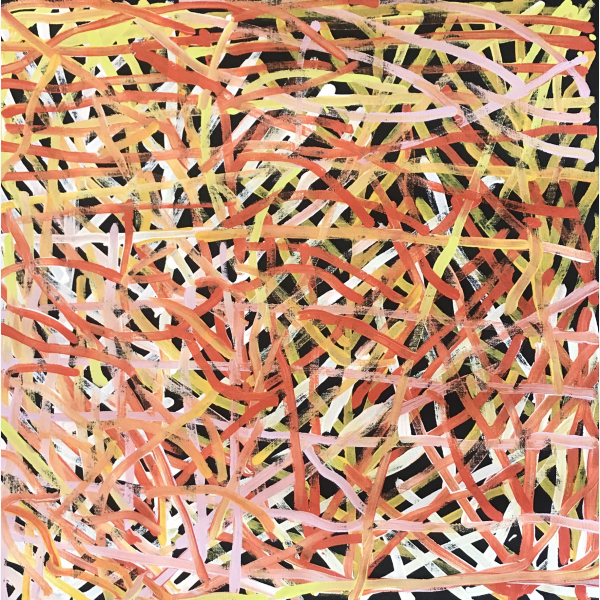 “Awelye-Atnwengerrp” is depicted by a series of lines painted in different widths, patterns and colours that are explosive, colourful and energetic. The patterns represent the designs painted on women’s bodies during bush tucker ceremonies in Atnwengerrp. Molly has developed her own unique, contemporary style and is progressing into a major talent.